'Muleshoe Money' (Tom Burseen, R. 2010). Seedling 07-229A. TB, 33" (84 cm), Late bloom season. 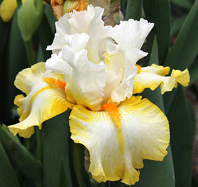 Standards white, fine gilt rim, open; style arms white, feathered gilt tips; falls creamy lemon (RHS 18D), heavy gold edges, center stripe and veins; beards marigold orange; ruffled, very flared; slight spicy fragrance. 'Glitter Gulch' X 'Sammie's Jammies'. Burseen 2011.